Toilets can be a matter of life and death. This city takes that seriously. PUNE, India — Being pregnant, Nikita Vavale finds herself needing to go to the bathroom a lot these days. But what should be only a slight inconvenience is preventing her from leaving the house because public restrooms are hard to find. Basic sanitation services are severely lacking in India, where 40 percent of the country's more than 1 billion people practice open defecation, according to 2015 World Bank figures. This can result in the spread of deadly diseases, including cholera, diarrhea and typhoid. Compounded with dirty drinking water, poor sanitation kills around 842,000 people globally each year, according to the World Health Organization. Poor sanitation alone leads to an estimated 280,000 deaths related to diarrhea, according to the organization. In India, nearly 400 children under the age of 5 die every day because of poor sanitation, according to UNICEF. 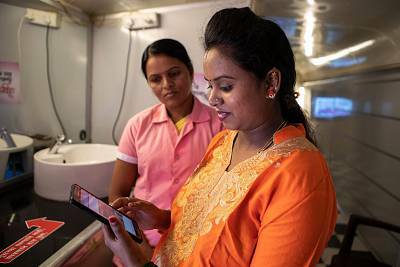 Innovations ranging from restrooms on wheels that also boast Wi-Fi access and cafes, to digital sensors in human waste that seek health trends are being tested here in Pune, a city of 4 million in western India that is serving as a real-world laboratory for sanitation systems of the future. "What we're trying to do is build up this sense that the sanitation system isn't something that is forgotten on the dirtiest street corners but it's part of a modern, thriving city," Sandy Rodger, chief operations officer of the Toilet Board Coalition, said in an interview in London. The coalition is a global partnership helping to broaden the reach of start-ups and small firms that deal with sanitation by connecting them with established corporations in low-income countries. While the gap in services in places like India can appear daunting, Rodger said it also offers opportunities. 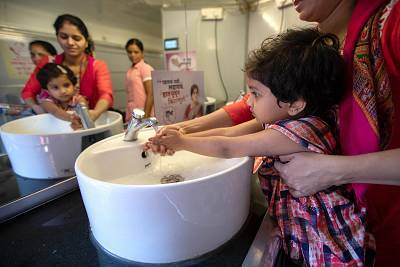 Unlike cities in the West with old and difficult-to-upgrade sanitation systems, cities like Pune have newer systems and offer a cleaner slate. "Our focus is on communities with less infrastructure, so you are in these leapfrog opportunities where you don't have to repeat these mistakes," Rodger said. The Toilet Board Coalition sees the money-making potential of the "sanitation economy" — which ranges from high-tech toilets to the extraction and use of biofuels from waste — and estimates that it will be worth $61 billion in India alone by 2021. The coalition is looking beyond improving facilities. A project being developed by the European Space Agency will include toilets with specialized sensors that extract information from waste. These sensors will be able to detect disease outbreaks such as cholera before individuals begin to show symptoms, allowing health officials to react early and potentially limit the spread, according to Sunil Agarwal, the director of the coalition's Smart Sanitation City Project in Pune. The sensors will also be able to look for vitamin deficiencies and other indicators to assist with public health activities. The health data collected will not be tied to individual users of the public facilities in order to ensure privacy, Agarwal added. The information from sensors could be groundbreaking not only in limiting the damage of an outbreak, but saving health authorities money as well. Poor sanitation leads to $200 billion a year in health care costs and lost income worldwide, according to the Bill and Melinda Gates Foundation, the world's biggest private philanthropy organization. Rodger said identifying health issues early could result in thousands of people who don't "need to go to the doctor, who didn't need to use health care services." The Japanese government is also helping India build 11 sewage treatment plants in Pune, which is about 70 miles southeast of Mumbai. A major requirement for at least two of the facilities is that they include resource recovery technology like biogas or compost, Agarwal said. Converting waste into fuels or fertilizers creates the potential to generate revenue, Rodger said. It also takes away the "yuck factor" by talking about human waste as a resource, and transforms sanitation into an economic opportunity, he added. "In nature, you have this idea that everything is just food for some other organism. So what we're doing is bringing it back to this reality," he said. 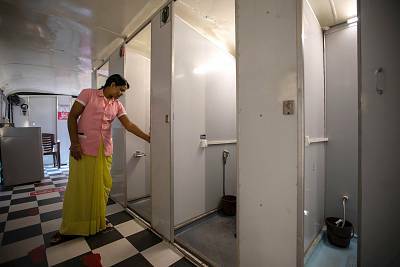 Vavale, the mother-to-be, was fortunate enough to find a clean and safe public restroom catering to women while out in Pune on a recent Monday. 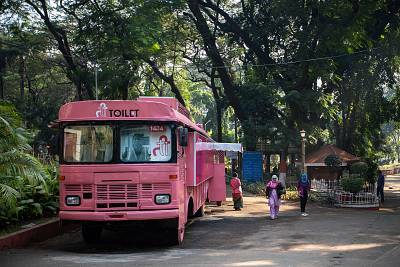 The bright pink Ti bus toilet is one of 12 such facilities around the city offering not just a clean toilet and sinks but also sanitary napkins, Wi-Fi access and charging ports for cellphones. "Women are stepping out of homes and working at different levels, so this gap of not accessing clean toilets is a drawback," said Ulka Sadalkar, executive director of Saraplast, the company that builds and runs Ti, short for Toilet Integration, in partnership with the municipality. The Ti buses were launched in 2017 in partnership with the Toilet Board Coalition. They have a combination of Western-style toilets and squatting pans. A female caretaker is on site 12 hours a day, and maintenance specialists monitor all the facilities to stay on top of repairs. Sensors in the converted buses monitor temperature and humidity and are connected to a main control room to alert maintenance staff when breakdowns occur. It also prompts on-site staff to improve ventilation or cap the number of users in the bus at once, to keep the space comfortable. 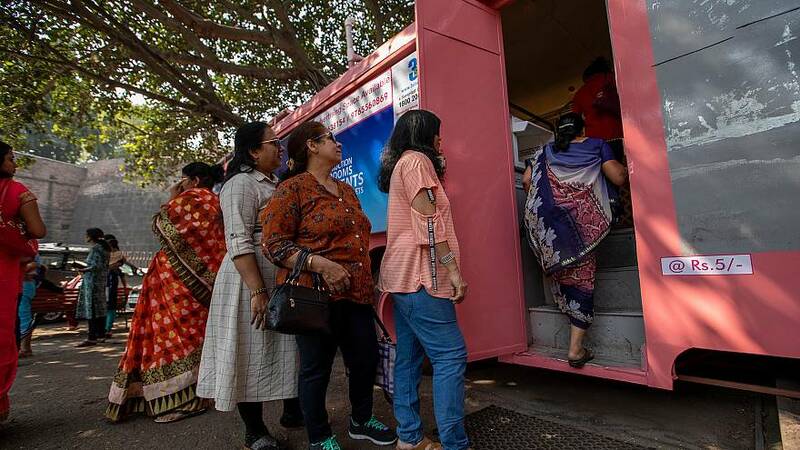 While the local government has rolled out similar "e-toilets" that operate by coin, many of them are regularly out of service, residents say. The consequences of a lack of facilities are significant, particularly for women. Shiv Kalani said she had a "horrible experience" traveling across the province of Maharashtra with her daughter, who is prone to getting urinary tract infections. They spent two hours looking for a clean facility to use in Pune before finding the Ti bus. "I would prefer sitting in the open than using a public toilet," Kalani said. "Imagine the kinds of diseases we contract using a dirty toilet." In addition to hygiene, there are also safety concerns. Many public toilets lack water and electricity, making them so dark inside you can't see your hand in front of your face. Some facilities separate male and female facilities with only a curtain. Those that are managed often have male caretakers, which makes some women nervous. Kavita Pawar, 17, was recently searching desperately for a toilet with a friend who was menstruating. They found one public facility, but it was dark and there were men hanging around, so they decided against it. "Where is our safety?" said Pawar, a college student. "If I ever want to go to the bathroom badly, I have no choice but to wait until I reach home." Priti Gupta reported from Pune, and Linda Givetash from London.